← Massage Envy – so that happened..
Skateboarding is not a crime.. Eating the road is.. So what is contributing to the 30 day challenge? this is. I was longboarding (skateboarding) and it was dark (not ideal) , I didn’t turn correctly and then proceeded to meet the ground. It was quite humorous, and snapped my humorous, but in the end was not humorous. Let’s just say it was a great experience and yes I would do it again, but next time on water. 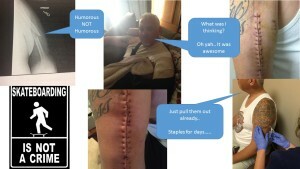 Here’s a snap shot of the accident, me after and the staples. Yes staples and was it fun to have them slowly pull them out of my skin. What I can say is that the doctor was pretty awesome for not cutting through my tattoos to make the incision for the surgery, thank you Doc. Now for my arm being metal now, well it’s a great story and feels funny when your getting a massage. Onward – more to do, more to NOT damage. bahhh.. This entry was posted in 30day. Bookmark the permalink.